HTC One M9 has been released in March, 2015. With 5.0 inches screen, people prefer to watch videos on HTC One M9. If you have some purchased movies from iTunes Store, and want to transfer them to HTC One M9, how to do? As known, all the purchased movies from iTunes Store are DRM protected, that is, you can only play them on Apple products (Up to six devices.) For the DRM, you need to authorize to the Apple devices or computer before you play the movies. Hence if you want to play the purchased movies on HTC One M9, you need to remove DRM from the purchases and convert them to the video format for HTC One M9. M4V Converter Plus is the tool to help you remove DRM and convert the purchased movies so as to playable on HTC One M9 with high conversion speed and excellent output quality. Quick guide to remove DRM from iTunes purchased movies and convert them for HTC One M9. First free download the trial version of M4V Converter Plus. It supports both Windows version and Mac version, you can choose one according to your computer system. 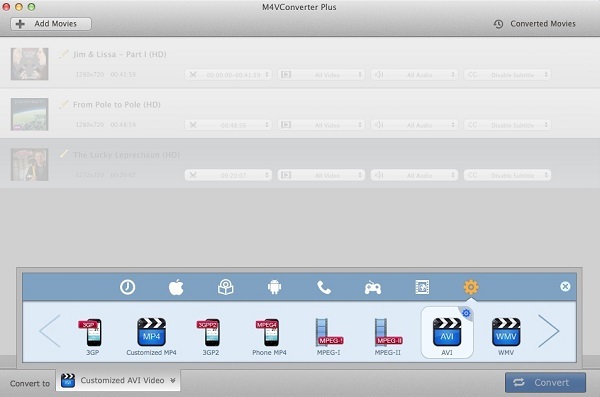 Here we took M4V Converter Plus for Mac version for example to show that how to convert the purchased movies one by one. Step 1: Install and run M4V Converter Plus. Step 2: Click the Add Movies button or Add Files icon to load the movies your purchased from Movie library. Step 3: According to your requirements, you can click the time setting box then choose Custom option, input the Begin and End time to convert the clips which you want. Or you can click the pencil icon in the file list, and input the new name of the output file. Click the Preferences… through M4VConverter Plus – Menu to reset the output folder according your need. Step 4: In the profile drop-down list, there are kinds of output presets and video formats to choose, here we choose “Same as source for mp4”, which also supports 30X+ faster conversion speed. 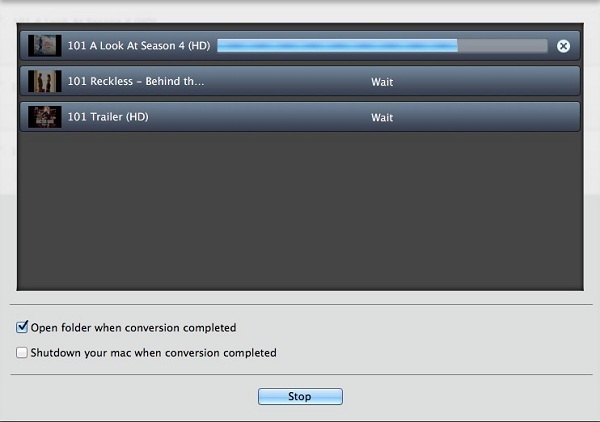 Step 5: Click the button Convert to start conversion, at the same time, iTunes launched. After conversion, you can transfer the converted MP4 videos to your HTC One M9 easily and enjoy them freely. For more detailed information about M4V Converter Plus, go to the online guide center.